Michael Janisch’s Whirlwind Recordings label continues to release new material at a rate of knots. Joel Harrison’s Spirit House is a quintet assembly of the guitarist and four of his musical collaborators. The leader has written pieces with the musicians in mind, this isn’t a guitar-centric album. Trumpet and bassoon plus Harrison’s ‘saturated guitar voicings’ – a three-horn frontline – work with the bass and drums dream team of Kermit Driscoll and Brian Blade. Harrison’s aforementioned ‘voicings’ encourages one to listen intently; is that Harrison’s guitar? Is it Cuong Vu’s electronically reconfigured trumpet? Could it be bassoonist Paul Hanson? No matter, the strong soloist is trumpeter Vu. Embracing Miles (circa 1970) and Kenny Wheeler’s sound, Vu stretches out on several of the nine tracks on Spirit House. A prog rock core to the album is evinced in Harrison’s Pink Floyd-inspired vocals. All the compositions are Harrison’s except Paul Motian’s Johnny Broken Wing. The track suggests Kenny Wheeler way down in Mississippi! Harrison’s rhythm section is of A-list calibre. Agile bassist Kermit Driscoll works in tandem with the in demand, creative Brian Blade. Spirit House reaches out far beyond any notion of jazz parameters. Those prepared to listen beyond the jazz spectrum will be richly rewarded. 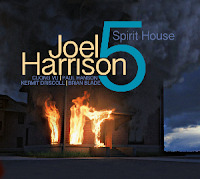 Joel Harrison 5 Spirit House is released on July 6 on Whirlwind Recordings (WR4673). In the autumn Harrison will tour the album in the UK.